This article shows how to play with pre-trained Mask RCNN model. Mask RCNN networks are extensions to Faster RCNN networks. gluoncv.model_zoo.MaskRCNN is inherited from gluoncv.model_zoo.FasterRCNN. It is highly recommended to read 02. Predict with pre-trained Faster RCNN models first. 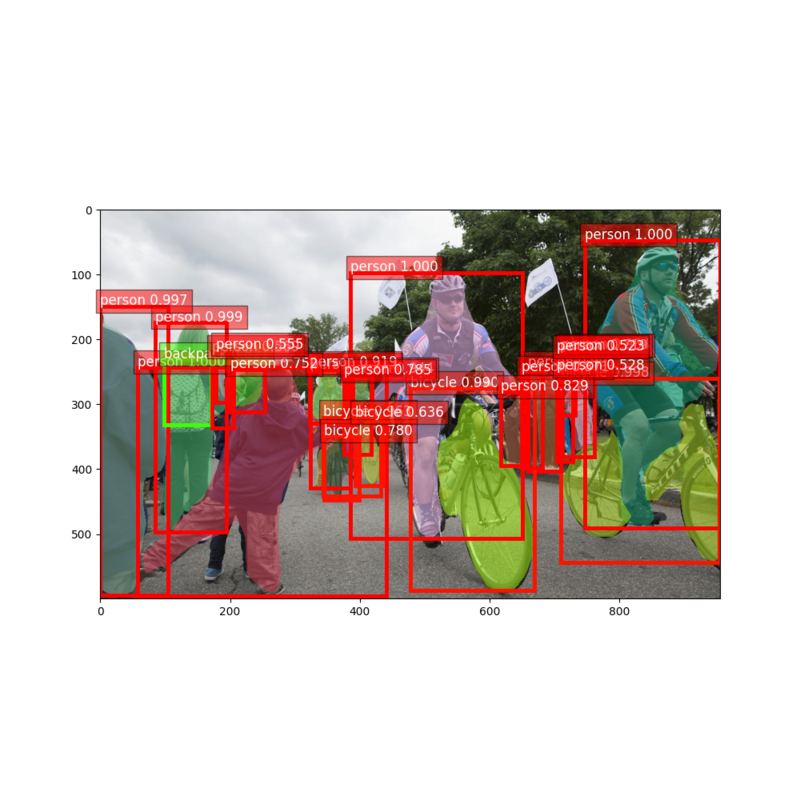 Let’s get an Mask RCNN model trained on COCO dataset with ResNet-50 backbone. By specifying pretrained=True, it will automatically download the model from the model zoo if necessary. For more pretrained models, please refer to Model Zoo. The returned model is a HybridBlock gluoncv.model_zoo.MaskRCNN with a default context of cpu(0) . The pre-processing step is identical to Faster RCNN. The Mask RCNN model returns predicted class IDs, confidence scores, bounding boxes coordinates and segmentation masks. Their shape are (batch_size, num_bboxes, 1), (batch_size, num_bboxes, 1) (batch_size, num_bboxes, 4), and (batch_size, num_bboxes, mask_size, mask_size) respectively. For the model used in this tutorial, mask_size is 14.
gluoncv.utils.viz.expand_mask() will resize the segmentation mask and fill the bounding box size in the original image. gluoncv.utils.viz.plot_mask() will modify an image to overlay segmentation masks.